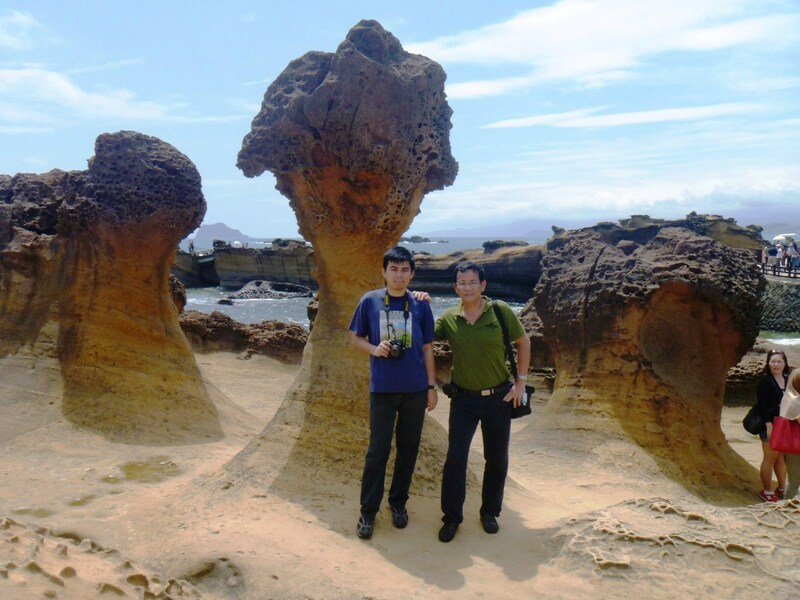 From Chang Chung Park, we next proceeded, down the hill and out of the city proper, to Yehliu Geological Park. 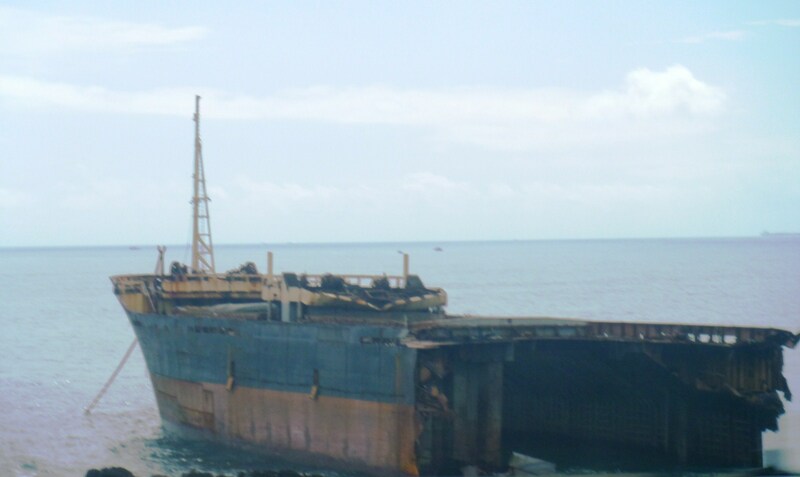 Along the way, we passed the remains of the Taiwanese-owned, Panama-registered gravel ship Jui Hsing. On October 3, 2011, this 155 m. long, 11,500 ton ship, bound for Fujian province in China, ran aground and broke in half, in high seas 185 m. off Dawulun Beach, near Keelung Harbor, during the height of Typhoon Nelgae. Of its 21-man crew, 6 were killed, 4 missing and 11 were rescued. 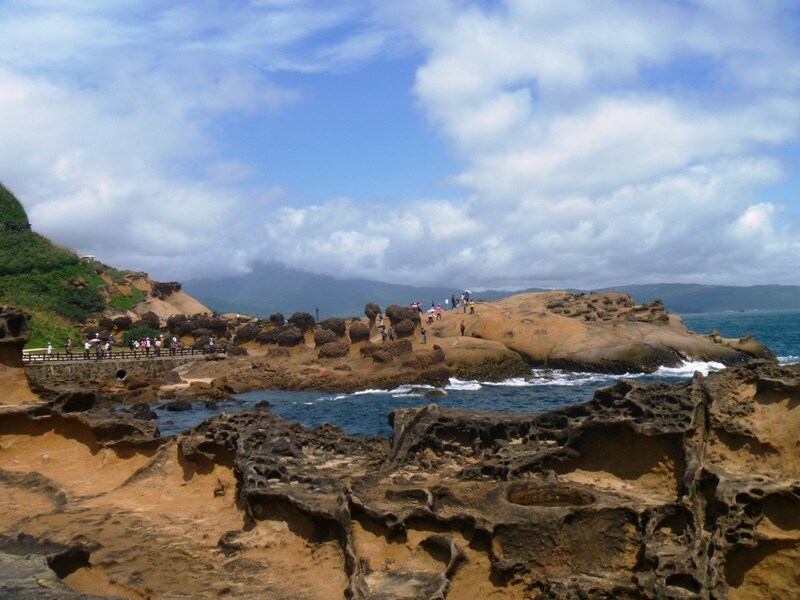 When we arrived at the Visitor’s Center (Yehliu Nature Center), the parking lot was filled with tourist buses loaded with tourists bound for either Ocean World, Yehliu Geopark or both. 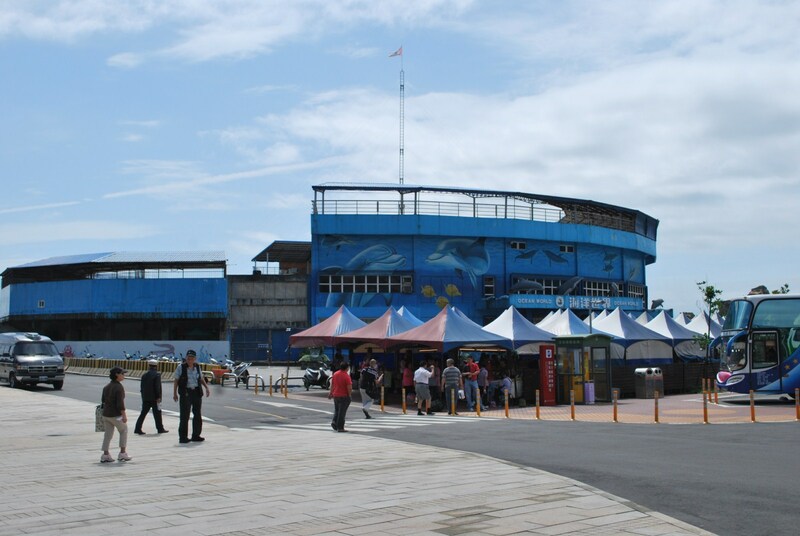 Ocean World, the first marine center in Taiwan for exhibition of ocean evolution, has an undersea sightseeing tunnel where you can observe about 200 rare fish species. Its 3,500-seat stadium is also the site of excellent shows featuring whales, dolphins and seals doing diving, ballet on water and other talent shows. 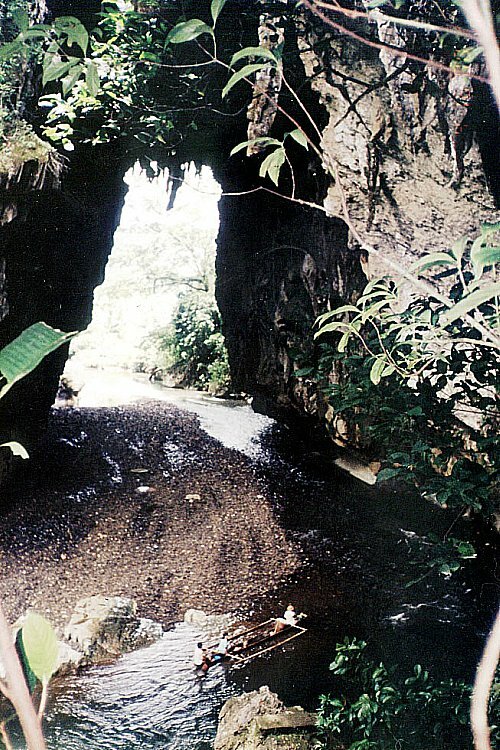 The second section, similar to the first area but with lesser numbers of mushroom and ginger rock rock formations, is home to the iconic “Queen’s Head” (the unofficial emblem for the town of Wanli), “Bean Curd” and the “Dragon Head.” Near the coast, rocks here have also developed into 4 different kinds of formations: “Elephant Rock,” the “Fairy’s Shoe,” “Earth Rock” and “Peanut Rock,” special shapes resulting from sea erosion. 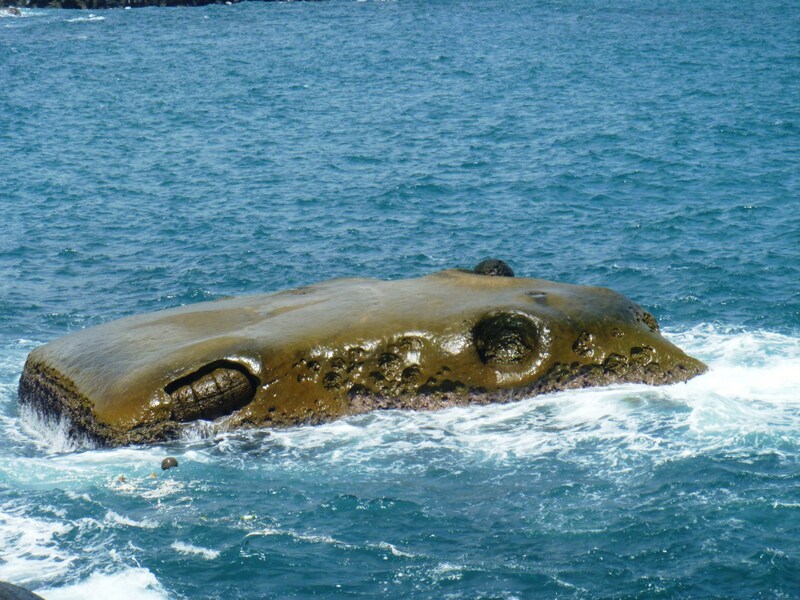 “Elephant Rock” Legend has it that a fairy forgot to bring the elephant back when she defeated the turtle elf; as result, the elephant stood there waiting to be taken home, refusing to go ashore. “Fairy’s Shoe” Legend has it that this one piece of shoe was left accidently by a fairy that came down to earth to tame the naughty turtle elf. 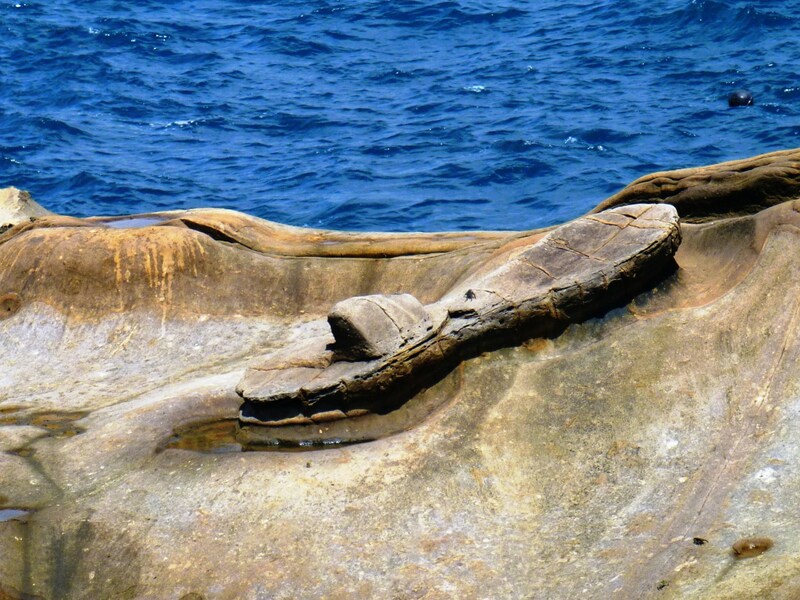 The much narrower third section, the wave-cut platform located on the other side of Yehliu, has sea-eroded caves, seal-shaped rock, etc. One side of the platform is adjacent to steep cliffs while, down below, the other side is a scene of torrential waves. 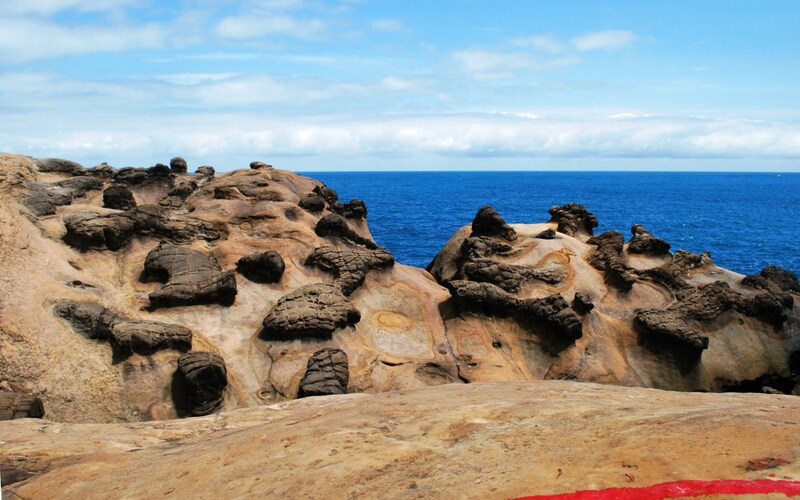 It has several rocks of grotesque shapes and sizes, all a result of sea erosion, including the “24 Filial Piety Hill,” “Pearl Rock” and “Marine Bird Rock.” In addition to the said rock landscapes, the third area also includes the major ecology reserve of Yehliu Geopark. 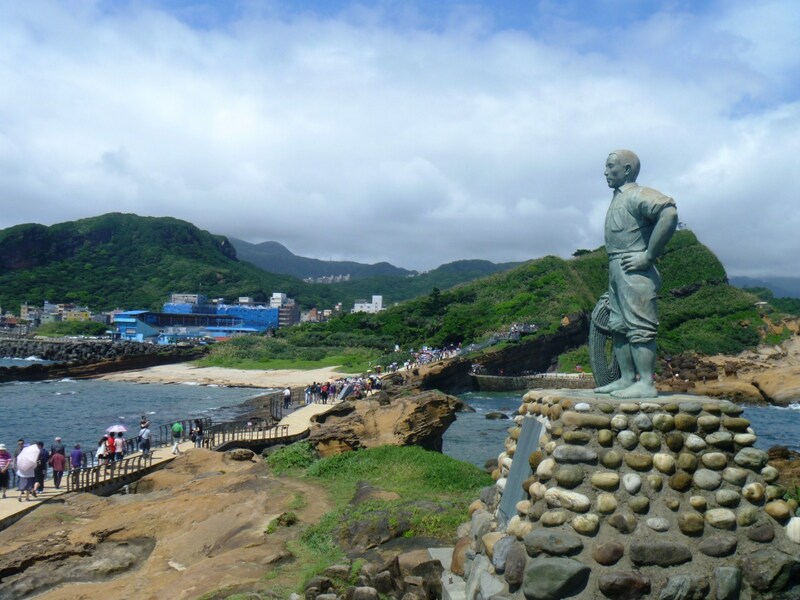 While touring, we also noticed a statue dedicated to Lian Tian Zhen, a local fisherman who, on March 18, 1964, jumped into the sea to save student Chang Guoquan who fell into the sea by accident. Unfortunately, both of them drowned. 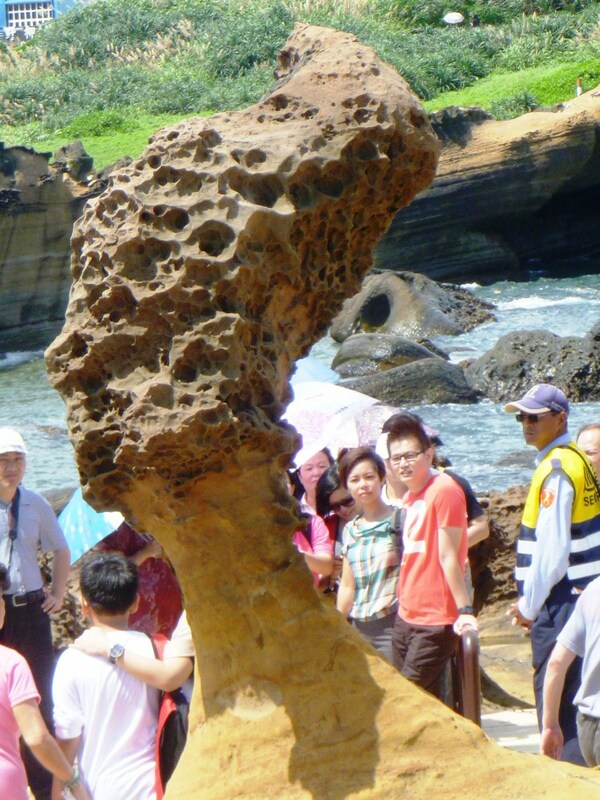 Yehliu Geological Park: No.167-1, Kantung Rd., Yehliu Village, Wanli District, New Taipei City 20744, Taiwan. Tel: (+886-2) 2492-2016. Fax: (+886-2) 2492-4519. Website: http://www.ylgeopark.org.tw. E-mail: info@ylgeopark.org.tw. Open 8 AM-6 PM. Admission: NT$50 (20% discount for group ticket of 30 people or more). From Tamshui, take the express bus bound to Jinshan at Tamshui station (near Tamshui MRT Station). They say it takes 40 to 60 people to encircle the gigantic trunk. The incredible tree’s thick aerial roots have grown above the ground, forming “caves,” and one can also enter the hollow interior of the tree which was once another tree clung to and killed by the balete tree. 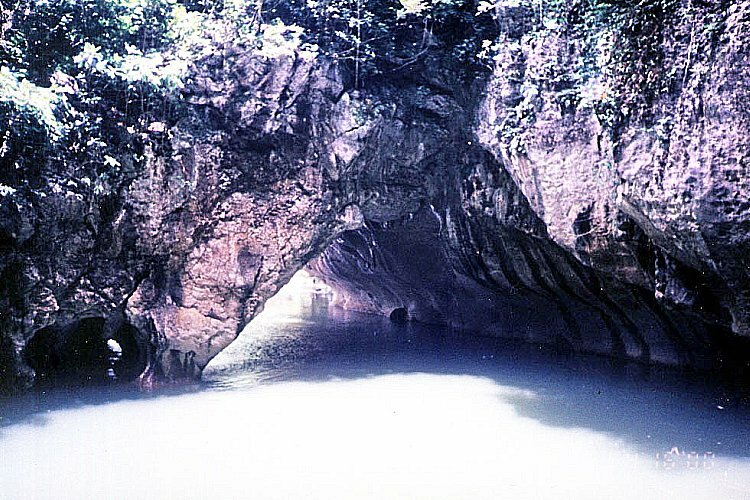 Its 60 m wide crown has survived numerous extreme typhoons. The trunk occupies around 190 sq. m..
Millennium Tree: Balete Park, Brgy. 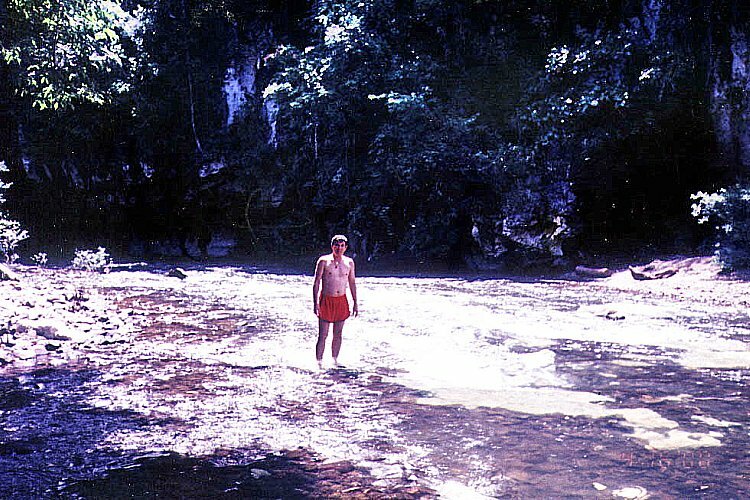 Quirino, Maria Aurora, Aurora. Admission: PhP10/pax. How to Get There: Balete Park is located 3.5 kms. from Maria Aurora. From Baler, hire a tricycle to get there (30-min. travel time). Coordinates: 15.7698N 121.4770E. From Baclayon, we proceeded to the junction town of Loay and, from there, traveled up north to the town of Carmen and the Chocolate Hills, a destination truly synonymous with the province. 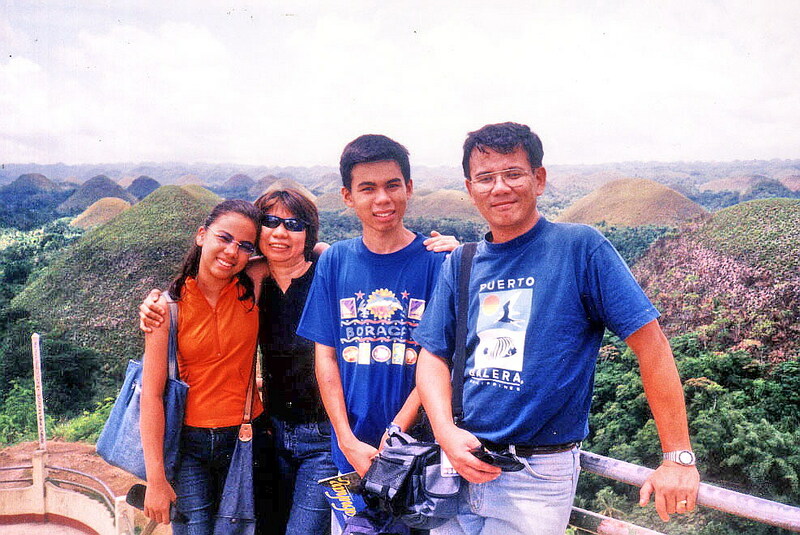 Along the way, we passed some of Bohol’s wonderful scenery, including a man-made forest of mahogany trees in Bilar standing in perfect symmetry along the road leading to Carmen. Upon arrival at the complex, we ascended 213 concrete steps to reach the observation deck, the hill’s main vantage point. Early morning and late afternoon (to watch the setting sun) are said to be the best times for photographing this strange and mysterious landscape. You can also hike between the hills. 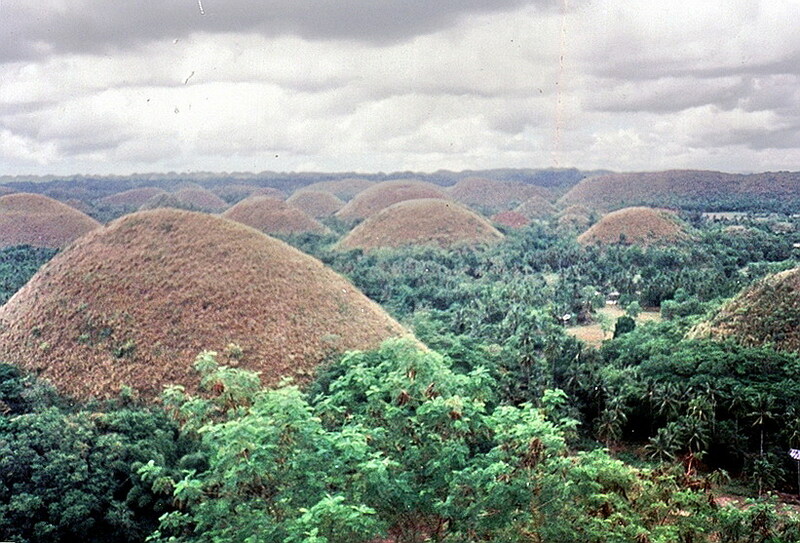 This 14,145-hectare Philippine National Geological Monument consists of 1,268 grass-covered, cone-shaped “haycock” hills, a broad, half-kilometer high upland plateau irregularly distributed among the towns of Carmen, Sagbayan and Sierra-Bullones in the east central part of the island. 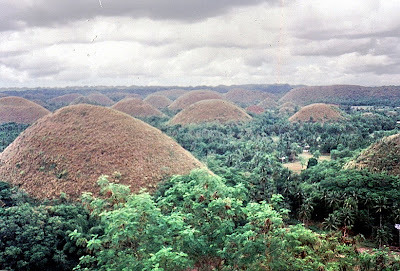 Formed of sedimentary limestone, shale and sandstone, these 30 to 120-m. high, beautifully arranged and symmetrically formed hills look like droplets of Hershey’s chocolate, thus their rather sumptuous name. They also look a delectable chocolate brown during the dry months of April and May, before turning a deep shade of green during the rainy season.